Dr. Ghadimi Mahani is a Clinical Lecturer in the Department of Pediatrics and Communicable Diseases and in the Department of Radiology, Cardiothoracic Division and Pediatric Section; and Dr. Agarwal is an Assistant Professor in the Department of Radiology, Cardiothoracic Division, University of Michigan, Ann Arbor, MI. 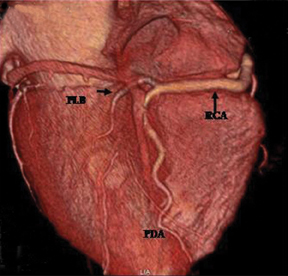 The prevalence of coronary artery anomalies is reported to be approximately 1% to 2% in the general population.1,2 The clinical presentation isvariable and the abnormality may remain clinically occult or it can have life-threatening consequences, such as myocardial infarction, arrhythmia, or even sudden death. Even if the anomalies are asymptomatic, knowledge of their presence is important at cardiac surgery to avoid inadvertent damage to a vessel with an anomalous course. 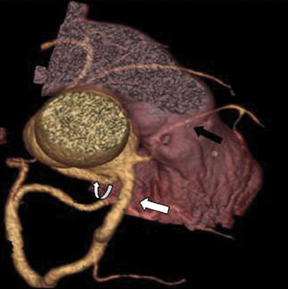 Various imaging modalities are available for coronary artery assessment. 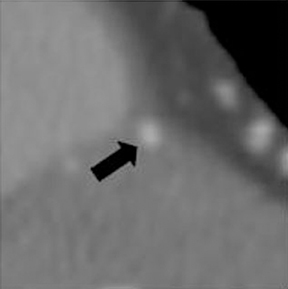 Traditionally, catheter angiography has been used to evaluate the coronary arteries and their anomalies; however, it is an invasive technique, and the exact course of the coronaries can sometimes be difficult to determine precisely. 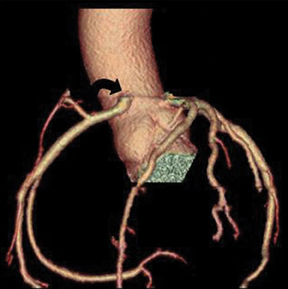 This is because angiography provides a 2-dimensional depiction of coronary anatomy and relies on a limited number of imaging planes, in contrast to cardiac computed tomography (CCT), which is noninvasive and has multiplanar capability. In addition, the acquired imaging data can be post-processed and viewed in any desired plane. 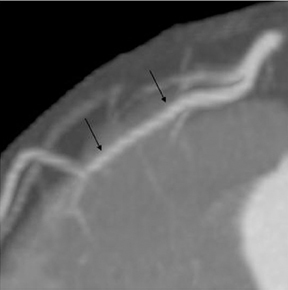 Magnetic resonance imaging (MRI) is another noninvasive technique that can depict the course of proximal coronary arteries, but without ionizing radiation exposure or intravenous contrast.However, it is not as widely available as CT, and is limited in the evaluation of the distal coronary arteries, and can be technically challenging to perform. 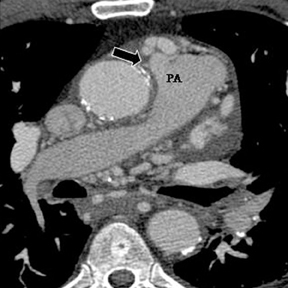 For these reasons, CCT has recently emerged as the test of choice for diagnosing coronary anomalies.2,3 In this article, we review the spectrum of coronary artery anomalies, particularly hemodynamically significant anomalies, as revealed by multidetector CT. 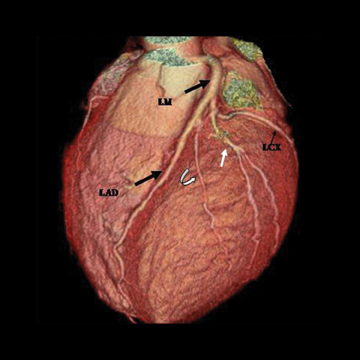 There are left and right principal coronary arteries.4 The left coronary system comprises the left main artery, which bifurcates into the left anterior descending artery (LAD) and the left circumflex artery (LCX). The right coronary artery (RCA) arises from the right anterior sinus of Valsalva and coursing through the right atrioventricular groove. The RCA arises from the anteriorly positioned right sinus of Valsalva (Figure 2) and courses through the right AV groove. The conus artery is the first branch of RCA in 50% of cases, and it supplies the right ventricular infundibulum. In the remaining 50% of cases, the conus artery arises directly from the aorta separately from the RCA.5 The sinoatrial (SA) nodal branch arises from the RCA in most patients (60%) and courses posteriorly. In the remaining patients it arises as a branch of the LCX. Other branches supply the right atrium and free wall of the right ventricle. 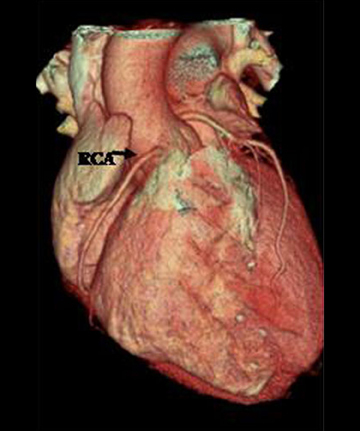 The largest of these arises from the RCA at the acute margin of the heart and is termed the acute marginal branch. At the crux of the heart the RCA gives off the posterior descending artery, which supplies the posterior interventricular septum. The posterolateral branch (PLB) is a continuation of the RCA in the posterior atrioventricular groove and supplies the posterior and inferior wall of the left ventricle (Figure 2). Deviations from normal coronary anatomy are termed as variants or coronary artery anomalies (CAA). It has been proposed that a normalvariant refers to an alternative pattern that is relatively infrequent compared to normal, but is seen in more than 1% of the population; in contrast to an anomaly that is seen in less than 1% of otherwise normal individuals.4,6,7 In the following discussion the authors review a spectrum of coronary anomalies and variants (for purpose of discussion these have been collectively grouped under “anomalies”). Various classification systems for CAA have been proposed.3,5-8 In this review the CAAs are divided into 4 main groups:3,5 anomalies of origin, course, termination,and intrinsic (Table 1). 1. Number of coronary ostia. Normally there are 2 coronary ostia (one for the right main coronary artery and one for the left). It gives rise to the left main and RCA or courses directly to the LAD, LCX, and RCA.8 One or more arteries can have an anomalous course. This abnormality can have an adverse clinical outcome, particularly if one of the arteries takes an interarterial course (also termed a “malignant”course. See discussion below). >3. Anomalous origin of the coronary artery from opposite sinus. In this anatomy, the coronary artery arises anomalously from the opposite sinus and then takes one of the 4 paths described below. The precise path taken by the artery is important clinically. An interarterial course (previously called a malignant course) carries a high risk of sudden cardiac death, while the other 3 courses are considered nonmalignant or relatively benign. a. Interarterial. In this case, a coronary artery (such as the RCA, left main, LAD or LCX) arises from the opposite sinus and courses between the aortic root and pulmonary artery/right ventricular outflow tract (Figures 5 and 6). This anomaly has been linked with sudden cardiac death. 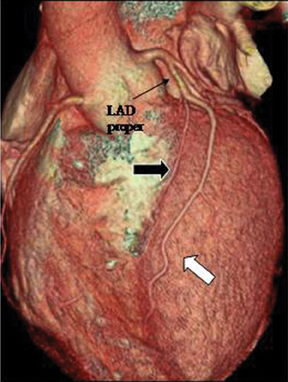 Several pathologic processes have been implicated; they include a narrow slit-like orifice, an acute angle of the ostium witha tangential proximal course of the ectopic coronary artery, and an intramural course where the coronary artery exits the aortic lumen and courses into the aortic wall before emerging on the surface. A consequence of this anomaly is lateral arterial compression, which worsens in systole, and the artery appears ovoid in cross-section.2,3,6 The flow can be further compromised during exercise due to aortic dilatation. 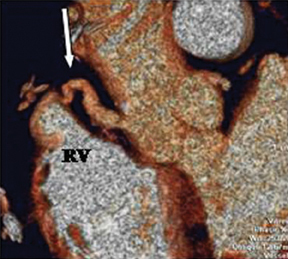 c. Retroaortic..= This is the most common coronary artery anomaly, seen in 0.9% of the population. The ectopic coronary artery (more commonly the LCX) runs posteriorly between the aortic root and the left atrium (Figure 8). d. Prepulmonic. The ectopic coronary artery runs anterior to the pulmonary artery or right ventricular outflow tract (Figure 9). 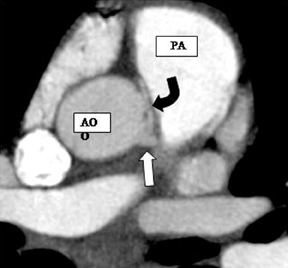 Anomalous origin of the coronary artery from pulmonary artery (ALCAPA). This is one of the most serious anomalies, with a 90% mortality rate in the first year of life.2, 3 Most patients are symptomatic in infancy and early childhood. Either the RCA (Figure 11) or the LCA can arise from the pulmonary artery. ALCAPA appears more common (0.008% versus 0.002% for RCA). It is conceivable that this apparent difference may be due to the fact that ALCAPA carries a worse prognosis and is more likely to come to clinical attention. 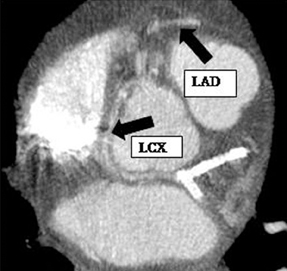 In rare instances the LCX or both the RCA and the LCA can take origin from the pulmonary artery.Coronary artery origin from the pulmonary artery can occur as an isolated finding, though an associated cardiac abnormality, such as ASD, VSD, tetralogy of Fallot, aortic coarctation, double outlet right ventricle, and patent ductus arteriosus, can be seen in 5% of cases.2,12 In the most common form of this anomaly, the LCA arises from the pulmonary trunk, and the RCA arises normally from the aorta (Bland-White-Garland syndrome). 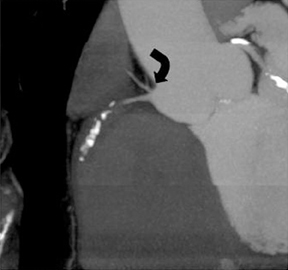 Extensive intercoronary collaterals develop that are often dilated and tortuous. Symptoms usually occur due to coronary steal phenomenon caused by the flow of blood from the higher pressure coronary arterial system to the lower pressure pulmonary arteries.Surgical treatment is usually recommended for these anomalies. 2. Duplication. This anomaly refers to 2 LAD arteries: one short LAD, which terminates in the anterior interventricular groove without reaching the apex, and one long LAD, which originates from the LAD proper or anomalously from the RCA/opposite sinus, enters the distalanterior interventricular groove, and terminates at the apex. Care should be taken to avoid mistaking a long LAD for a parallel diagonal branch.The differentiation is relatively straightforward, since a diagonal artery does not enter the anterior interventricular groove (Figure 13).3 Knowledge of this anomaly is important for planning surgical vascularization and to avoid mistaking a short LAD artery for a mid-LAD occlusion. 1. 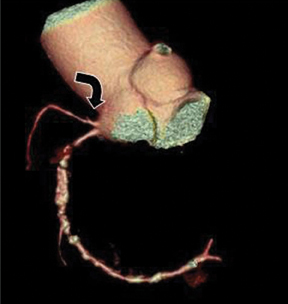 Coronary arteriovenous fistula. This is an abnormal communication between a coronary artery and a cardiac chamber, coronary sinus, superior vena cava, or pulmonary artery. The prevalence is reported to be 0.002%.10 Various etiologies are known; they include traumatic, infectious, and iatrogenic causes. The involved fistulous artery is often dilated and tortuous. Drainage is important to recognize and determines the hemodynamic abnormality. The most common site of drainage is the right ventricle creating a left to right shunt. There may be steal phenomenon with consequent myocardial ischemia. Drainage to a left-sided heart chamber causes a hemodynamic state similar to aortic regurgitation. 3. Extracardiac connections. 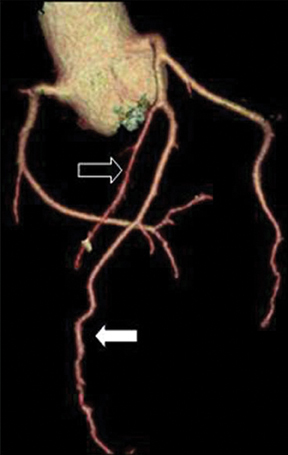 Coronary arteries may have connections to extracardiac arteries, such as the bronchial, internal mammary,pericardial, superior and inferior pherenic, intercostals, and esophageal branches of the aorta.17 These connections become significant with the development of coronary artery disease. 1. Coronary stenosis. Though coronary stenosis is mostly acquired, congenital coronary stenosis has been described2 and can be ostial (due to a valve-like ridge of the aortic wall or fusion of the aortic leaflets and aortic wall) or peripheral. 2. 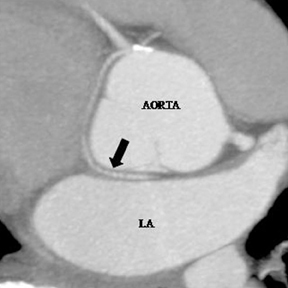 Congenital atresia of the left main coronary artery. In this condition there is complete atresia of the left coronary ostium, so the entire coronary arterial supply to the heart is derived from the RCA and its branches. The LAD and LCX are seen in their respective locations,but they receive blood from the RCA. This is an extremely rare condition and differs from a single RCA because some of the branches fill retrograde through the RCA.2 The collateral circulation from the right to the left coronary system is usually not sufficient so almost all patients eventually develop myocardial ischemia. Surgical reconstruction of a 2-coronary system by coronary artery bypass graft is performed in these patients. Dodd JD, Ferencik M, Liberthson RR, et al. 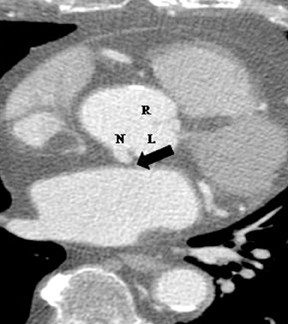 Congenital anomalies of coronary artery origin in adults: 64-MDCT appearance. AJR Am J Roentgenol. 2007;188:138-146. Montaudon M, Latrabe V, Iriart X, et al. 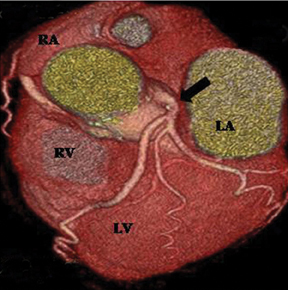 Congenital coronary arteries anomalies: Review of the literature and multidetector computed tomography (MDCT)-appearance. Surg Radiol Anat. 2007; 29:343-355. Kim SY, Seo JB, Do KH, et al. Coronary artery anomalies: Classification and ECG-gated multi-detector row CT findings with angiographic correlation. Radiographics. 2006; 26:317-333; discussion 333-334. Angelini P. Normal and anomalous coronary arteries: Definitions and classification. Am Heart J. 1989;117:418-434. Patel S. Normal and anomalous anatomy of the coronary arteries. Semin Roentgenol. 2008;43:100-112. 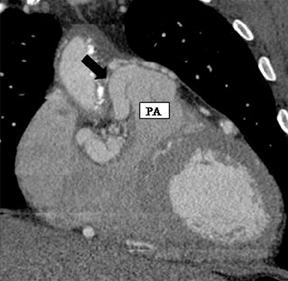 Angelini P. Coronary artery anomalies--current clinical issues: Definitions, classification, incidence, clinical relevance, and treatment guidelines. Tex Heart Inst J. 2002;29:271-278. Angelini P, Velasco JA, Flamm S. Coronary anomalies: Incidence, pathophysiology, and clinical relevance. Circulation. 2002;105:2449-2454. Kang JW, Seo JB, Chae EJ, et al. Coronary artery anomalies: Classification and electrocardiogram-gated multidetector computed tomographic findings. Semin Ultrasound CT MR. 2008;29:182-194. Vazquez-Jimenez JF, Haager PK, Genius M, et al. 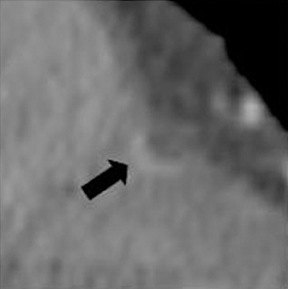 Anomalous origin of the left main coronary artery from the right aortic sinus with intramyocardial tunneling through the septum with free portion in the right ventricular cavity. J Thorac Cardiovasc Surg. 1999;118:963-965. Dodge-Khatami A, Mavroudis C, Backer CL. Congenital heart surgery nomenclature and database project: Anomalies of the coronary arteries. Ann Thorac Surg. 2000;69:S270-297. Angelini P, Walmsley RP, Libreros A, Ott DA. Symptomatic anomalous origination of the left coronary artery from the opposite sinus of valsalva. Clinical presentations, diagnosis, and surgical repair. Tex Heart Inst J. 2006; 33:171-179. Angeli E, Napoleone CP, Oppido G, et al. 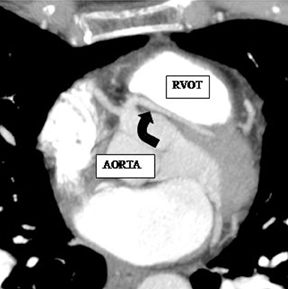 Anomalous origin of additional coronary artery arising from the pulmonary artery in complex congenital heart disease. Cardiovasc Pathol. 2008;17:190-191. Leschka S, Koepfli P, Husmann L, et al. Myocardial bridging: Depiction rate and morphology at CT coronary angiography--comparison with conventional coronary angiography.Radiology. 2008;246:754-762. Ko SM, Choi JS, Nam CW, Hur SH. Incidence and clinical significance of myocardial bridging with ECG-gated 16-row MDCT coronary angiography. Int J Cardiovasc Imaging. 2008;24:445-452. Mavroudis C, Backer CL, Rocchini AP, et al. Coronary artery fistulas in infants and children: A surgical review and discussion of coil embolization. Ann Thorac Surg. 1997;63:1235-1242. Kruskal JB, Hartnell GG. Nonatherosclerotic coronary artery disease: More than just stenosis. Radiographics. 1995;15:383-396. 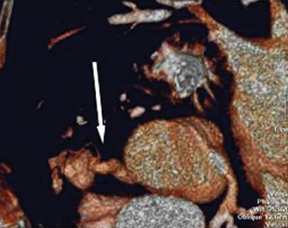 Greenberg MA, Fish BG, Spindola-Franco H. Congenital anomalies of the coronary arteries. Classification and significance. Radiol Clin North Am. 1989;27:1127-1146. Park RE, Occleshaw CJ, Finucane AK, et al. 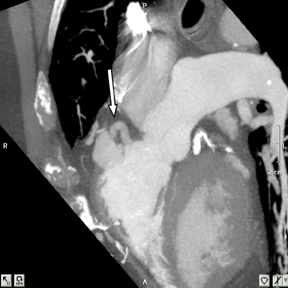 Giant congenital coronary artery aneurysm in pulmonary atresia with intact septum. Heart Lung Circ. 2009;18:310-312. 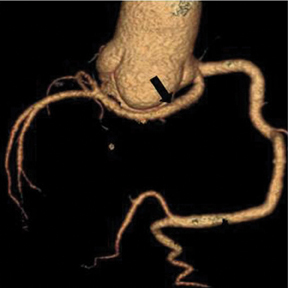 Coronary artery anomalies on CT angiography. Appl Radiol.